An excellent recent book about Debussy and his music by Eric Frederick Jensen (reviewed here at www.classical.net/music/books/reviews/0199730059a.php) presents a Debussy intent on creating a distinctive sound world. He did not wish to write music like any of his predecessors – and he did not want imitators or disciples either. He was successful in his first aspiration but of course there was less he could do about the work of successors. 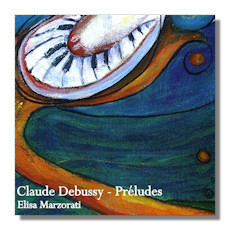 My first hearing of Elisa Marzorati's exemplary performance of Debussy's Préludes transported me vividly – and satisfyingly – to my first-ever hearing of anything by Debussy, which was a performance in Carnegie Hall many years ago – when I was fifteen – of Debussy's first two orchestral Nocturnes, performed by the New York Philharmonic conducted by Guido Cantelli. This was after an intermission, before which were played the Gazza Ladra Overture by Rossini and Brahms' First Symphony, Ravel's Second Suite from Daphnis and Chloe concluded the concert. The Brahms I was already familiar with, along with other works from the German and Russian repertoires, but I don't think I had heard a note of French music, aside from Claire de lune, before. These strange new sounds both fascinated and somewhat disturbed my young ears, beginning with the pre-concert practicing on stage of portions of the French works. Subsequently I learned to love everything by Debussy and I still find his music well-suited to clearing my aural palate from over-exposure to other music. The two books of Debussy Préludes were published in 1910 and 1913, not long after he completed the composition of each set. He died in 1918, so the second set in particular can be said to be from late in his career. The prelude form is one associated by J. S. Bach in the baroque era, Chopin in the romantic period, and Shostakovich well into the twentieth century. All of these composers completed sets of 24 preludes, accompanied by fugues in the first and last instances. The notes to the present collection describe literary or pictorial associations intended by Debussy. I would suggest that each book of the preludes be listened to separately. Not only are 24 short works a great deal to take in at one time, but there are some stylistic differences between them also. The unsigned notes, presumably by Marzorati, mentions bolder harmony, including bi-tonality, poly-tonality, and even "harsh dissonance" in the second set. Although I have some personal favorites among the pieces, there is no need for me to belabor that here. They speak for themselves and I have no fault to find with the performance of any of them. Notes are in Italian, German and English – surprisingly not in French, considering the nationality of the composer. Marzorati lives in Venice, where she grew up, and where she studied piano and musicology, with distinction in both cases. She was born in Switzerland and earned her second diploma in Zürich. Besides solo playing, she plays with singers and in chamber music ensembles.